Put the most trusted name in nursing in your hands. Mosby's 2020 Nursing Drug Reference is a full-color portable nursing drug handbook that makes it easy to find the most vital information on the drugs that nurses administer most frequently. More than 5,000 drugs are profiled in the text and on the free app - including 20-30 new entries for drugs and drug therapies recently approved by the FDA. Plus, no other drug guide places a higher emphasis on patient safety, with Black Box Warnings for dangerous adverse reactions, Safety Alerts for situations requiring special attention, and a focus on both common and life-threatening side effects of 50 common drug classes. 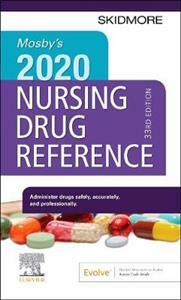 This 33rd edition proves once again why Mosby's is the bestselling drug reference for nurses on the market! Coverage of more than 5,000 generic and trade-name drugs provides information for almost every drug a student is likely to encounter in clinicals. Common and life-threatening side effects are organized by body system, showing signs to watch for during assessments. IV drug administration coverage in bold highlight dosage and IV administration instructions, including safety considerations and Y-site, syringe, and additive compatibilities. Safety Alert icon highlights the most critical drug interactions and side effects. Nursing Process steps are used as the framework for organizing all nursing care information. Complete pharmacokinetic information includes the mechanism and absorption of the drug as well as its action, duration, and excretion. Black Box Warnings provide alerts to FDA warnings of dangerous or life-threatening drug reactions. Logical, alphabetical organization by generic name provides quick and easy access to specific drugs, and a full-color design highlights important information. Cross-references indicate drug information that may be found in the appendices. NEW! 20-30 added monographs provide up-to-date content on newly released, FDA-approved drugs and drug therapies. NEW! More than 20 new Evolve-only drug monographs added to the existing Evolve-only drug monographs. NEW! Numerous herbal drug monographs included on Evolve site.